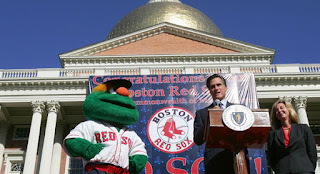 Jon Heyman of FanRag Sports Network reported yesterday that Mitt Romney and his son, Tagg, are in talks with the Yankees to buy a small percentage of the team. Based on the franchise’s estimated value of $3 billion, a percentage point in the team could be worth $25 to $30 million. The Romneys are said to be interested in one or two percentage points. The former Massachusetts governor and lifelong Red Sox fan had previously tried to buy the Miami Marlins and had expressed interest in the Los Angeles Dodgers before their sale. Romney has apparently denied involvement, but Heyman’s reporting of the alleged interest leads me to believe there is some life to it. I am not really interested in an owner, even a minority owner, that is a Red Sock by blood. Let’s say that the Romneys want to buy two percentage points. Assuming each percentage point is valued at $30 million, I have a price for the Mittster. For the bargain price of $149,571,428, he can have his 2%. $30 million x 2 = $60 million + Remainder of Jacoby Ellsbury’s Contract with 2021 buyout at $89,571,428. That’s the only palatable way that I can see to allow a Red Sock into the ownership group. With reports that Dellin Betances is already throwing nasty pitches in spring training, I couldn’t help but think that he must be visualizing each batter with Randy Levine’s face. I am never excited when a player participates in the WBC but at least Betances will be playing for a Yankees coach (Tony Pena) on the Dominican Republic team. On the downside, Team DR will most likely advance very deep into the competition if not winning it all. Hopefully there are no injuries to any of the Yankees participating in this year’s WBC competition. The spring baseball schedule kicks off today with the Philadelphia Phillies visiting Steinbrenner Field. Manager Joe Girardi has said he’ll start all of his regulars except for Jacoby Ellsbury, a late arrival to camp following the birth of his second child. Bryan Mitchell will start and will probably throw two innings. Alec Asher will start for the Phillies, with many names in the lineup that I do not recognize outside of Tommy Joseph, Cesar Hernandez and Chris Coghlan. Well, except for Daniel Nava , who is listed in today’s Phillies lineup as he attempts to make yet another comeback with a new team. Even though it’s just a meaningless exhibition game with early departures by the regulars, it’s great to see the Yankees take the field again.